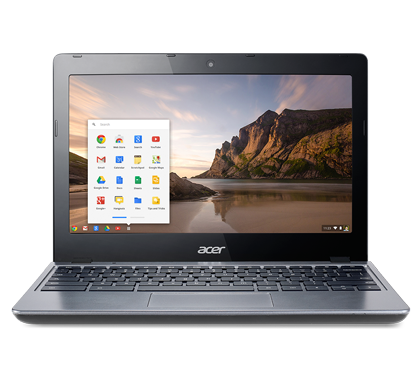 There might be a pattern coming along here but I promise you this will be the last one on my Acer C720 because after a week of usage enough happened to be able to make an informed review of the Chromebook and you can ready it here. But two weeks on is where it all fell apart literally. That’s right for some reason my ESC key came off and I was like what the hell it’s just over a week old and my keys are coming off already. I would like to add I’m not happy on my keys and have been a touch typist since the age of about 8 due to personal circumstances. That in mind though I managed to get it back on however a dare not press the one corner of the key. I feel though I could just be unlucky with that respect because all the other keys seems quite solid although. Although for a few days after I was a bit wary of it happening to others. I was tempted to send it back as it was still in the time you can send goods back but as the key is sat there nicely and not coming off as long as you stay away from the one corner I’m not going to worry too much. Also being the ESC it’s not as if your going to be typing using it so you can be careful on how you press it. The other thing that I noticed when shut down completely and turned back on. On the log in screen the wireless connects but then when you sign in and are ready to work it disconnects and then reconnects. I have posted in the Google+ community about it and found that I wasn’t the only one with this gimmick. I have tried the power-wash feature I have admit. While lending my Chromebook to my brother some how I ended up with two of my own accounts on it, so don’t know how that happened maybe because I haven’t made the switch to gmail.com from googlemail.com. However the wrong address had ownership of my Chromebook so I had to power-wash it and I have to say I won’t hesitate to do that again within 10 minutes I was back up and running as if nothing had happened. One other thing that I’ve had trouble with is notifications, my email and chat mainly. As my understanding was you got these regardless because your signed into your account on the Chromebook however after testing I seemed to need a custom URL in the notifications settings and the window open. Not that this is a huge deal because my Android Phone is never far away so can use that for those notifications although having my Chromebook do it would have been nice. Overall though the Chromebook has fitted in quite nicely into my set up and just by looking around this blog you will see that my productivity has gone up ten fold. Even with the slight issues I have had with it, I do feel that it is worth every penny, and would recommend it to anyone as a secondary device and even a first depending on the circumstance.